PEST controllers have had to deal with or remove cockroaches from the Royal Free Hospital’s buildings on more than 200 occasions in the past two years, according to figures released late yesterday (Wednesday). The information reveals unwanted guests have been a regular problem for the Hampstead hospital with expert attention needed to get rid of them on a weekly basis. 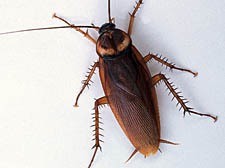 Cockroaches have been removed from the buildings 218 times since January 2006. On top of that, pest controllers have dealt with 25 incidence of mice and 10 cases of having to remove rats. Other pest problems include ants, flies and silverfish – the latter a creepy-crawly which loves slippery surfaces. Private operators ISS Pest Control are contracted to get rid of the bugs and rodents at the Royal Free. It is not clear in which areas of the hospital the pests were found and there is no suggestion that the infestations led to ill-effects for patients. Sources with knowledge of the hospital’s floorplan have suggested the pests are likely to have been found on the “service level” in a basement which insiders say is filled with corridors, storerooms and maintenance shafts, far away from patient wards, operating theatres or canteens. Staff are encouraged to report any sight of vermin or evidence of vermin as part of a general drive to stay on top of cleanliness. The hospital’s press office was unavailable last night, but a Royal Free official said regular patrols by pest experts mean that problems are always dealt with swiftly and effectively, minimising risks to staff or guests.